This is more than just another standard pea protein powder! PEA Protein PLUS is a blend of complete vegetable protein sourced from garden (sugar snap) peas. The protein is concentrated from the normal level of 6% in fresh peas, to around 80% - 76.2g per 100g! What’s more, this vegan protein shake has been fortified with antioxidants, phyto-nutrients, vitamins and minerals from 9 herbs and superfoods (including baobab fruit). It has an excellent amino acid and nutritional profile. 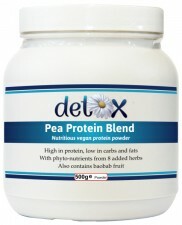 Pea protein is also highly soluble and therefore easy to digest and absorb - no bloating! Free from gluten, dairy, lactose, animal products, soya and other anti-nutritional factors, this hypoallergenic mix is an ideal source of protein for those with certain food intolerances / allergies. NOTE: PEA Protein PLUS contains a minimum of 16 servings per pot, based on a 30g serving. artificial preservatives, soya, fructose or added sugar. 1 serving (25g to 30g) to be mixed into water, fruit or vegetable juices etc, 1 - 3 times per day. PEA Protein PLUS can be mixed with many liquids, including water, juice and milk alternatives (like soya, hazelnut, almond and coconut milk etc) and blended with fruit, like banana, to make a healthy smoothie. Alternatively, it can be mixed into soups and stews.